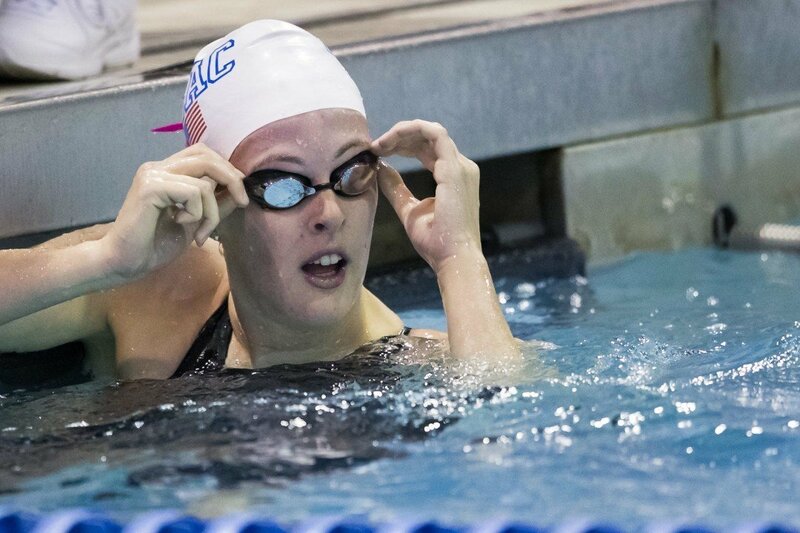 Besides the exhibition swims of Michael Phelps, the biggest story of the weekend so far at the 2015 American Short Course Championships has been the impressive results of his NBAC teammate Allison Schmitt. After two years of struggling, Schmitt has had a big meet, and while it’s in short course yards, rather than the internationally-important long course meters, the results are enough to provide Schmitt with some forward momentum going toward the summer. On Friday, Schmitt swam the 200 yard free, where she was a 1:40.62. That’s the second-fastest time in history, at any level, in the event, ranking behind only the 1:40.31 that Missy Franklin swam to win the NCAA Championships last year. Schmitt’s previous best, done in 2013, was a 1:41.85. SMU’s Samuel Straughan swam a 46.63 to win the men’s 100 yard backstroke. That was .03 seconds than what he swam at AAC’s – a time that has him tied for 33rd in the country and on the “bubble” for NCAA qualifying. The magic number, if Straughan tries the race again in a time trial, would be 46.45. If he cleared that mark, he’d be effectively locked in for an NCAA bid. Texas post-grad Lisa Boyce won both the 100 fly (52.25) and the 100 back (53.85). That time in the 100 fly is her fastest since finishing her undergrad career at Princeton a year ago.Of note, Aquazot 15-year old Eva Merrell swam a 52.46 for 2nd-place in the 100 fly. Dating back to 2001. that’s the third-fastest fly by a 15-year old over the last 14 years. Another NBAC swimmer, Frank Dyer, swam a 1:33.13 to win the men’s 200 free. He was followed by another SMU swimmer on the bubble – Christian Scherubl. For the freshman, that moves him from 40th in the NCAA this season up to 31st, which after accounting for swimmers who won’t enter this race at NCAA’s, puts him in solid, but not locked-up, position for NCAA qualifying. Bobby Bollier, coming off of a successful meet at the College Station Sectionals last weekend, won the 100 fly in 47.11. SMU’s Tyler Rauth was 2nd in 47.21, and NBAC pro Tom Luchsinger placed 3rd in 47.66. Local swimmer Sean Grieshop from Nitro won the men’s 400 IM in 3:44.45. That’s a new personal best for him, though it still leaves him 2nd on the all-time rankings in the event among 15-16’s (behind only Michael Phelps). Another NBAC individual win went to Becca Mann in the women’s 400 IM. She swam a 4:05.52 to beat runner-up Sonia Wang (4:09.85) by four seconds. Laura Sogar, who still represents Bluefish despite training with the Texas post-grad group, won the women’s 100 breaststroke in 1:00.44. Canyons 15-year old Nikol Popov took 2nd in 1:01.16 – missing her own lifetime best by half-a-second. Air Force’s Michael Barnosky won the men’s 100 breaststroke in 53.06, topping a tight race that included Texas’ Austin Temple (53.09), Denver’s Tim Cottam (53.16), and Missouri’s Igor Kozlovskij. Temple’s home-pool teammate Imri Ganiel was 5th in 53.92. All of those swimmers aside from the two Longhorns needed to improve position to make the NCAA championship meet, and it doesn’t appear as though any of them have done enough – with Barnosky ranked highest in the country now at 35th place. Full meet results are available on Meet Mobile. Wow. That is so awesome. I thought “the thrill was gone”. Go Schmitty! Great to see Allison swimming great. Someone posted why was she swimming the 500 yesterday. That is why because that is what makes American swimmers great by swimming other events and distances. Other countries should take note. John Nabor won the 1650 at a Nayionals back at Keating Natorium in Cinncinnati in the mid 70’d it was on the last day off meet and no other events to go in. He was in a prelim heat.he was a great freestyler. Stay on a roll Allison the more the better.